The 15th Edition of Pravasi Bharatiya Diwas got off to a grand start at Deendayal Hastakala Sankul in Varanasi today. 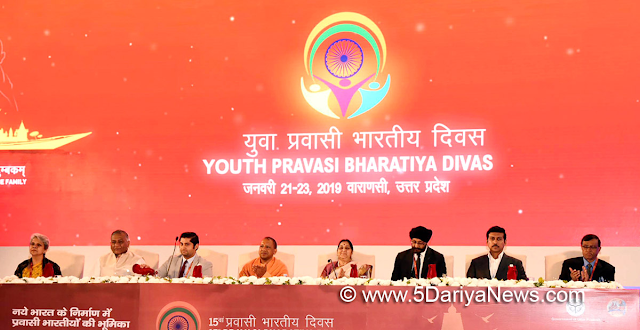 External Affairs Minister, Smt Sushma Swaraj inaugurated the Youth Pravasi Bharatiya Diwas on day one of PBD-2019. Union Minister of State and incharge of Overseas Indian Affairs- Gen. V. K. Singh (Retd.) along with the Guests of Honour- Himanshu Gulati, Member of Parliament of Norway and MP from New Zealand, Kanwaljit Singh Bakshi were present on the occasion. In her inaugural address, the External Affairs Minister said India is a land of limitless opportunities and Pravasi Bharatiyas are and will continue to be partners in progress of our motherland. She emphasized that shared identity and shared commonness are the key features which bind us together which will grow manifold in years to come. The Minister said that the story of Pravasi Bharatiyas is a tale of courage, determination and character and cited the examples of Google CEO, Sunder Pichai, Microsoft COO Satya Nadella, IMF Chief Economist Gita Gopinath to name a few. She thanked the diaspora for kindling a new wave for India abroad. Union Minister of State Information and Broadcasting (independent Charge) and Sports and Youth Affairs, Col. Rajyavardhan Rathore spoke about the unique and binding force of Indian identity and said Pravasi Bharatiya community is India's best Ambassador. He urged them to join in the building of a New India. The Minister lauded the role of NRIs in preserving their cultural values and respect for the motherland. Chief Minister of Uttar Pradesh, Yogi Adityanath said Uttar Pradesh looks up to the diaspora community for its valued contribution. 30 year old Norwegian MP, Himanshu Gulati recalled the journey of his parents from India to Norway 40 years ago. He said that natural resource are our biggest assets and youth must imbibe the values of Mahatma Gandhi, ‘Be the change you want to see’. Guest of Honour, MP from New Zealand, Kanwaljeet Singh Bakshi said Agriculture and Horticulture are key areas in which India and New Zealand can collaborate. The MP put up the request for Dual citizenship and Nomination of NRIs to Rajya Sabha for active participation in politics. He urged people to take pride in their culture and heritage. Youth Pravasi Bharatiya Diwas has been organized with a view to share the ideas for a New India among the NRI youth and the generation next back home. Large number of NRI youth and from NSS are taking part in the event. Prime Minister Narendra Modi will inaugurate the plenary session of 15th Pravasi Bharatiya Diwas Convention tomorrow. Prime Minister of Mauritius, Pravind Jugnauth is the Chief Guest on this occasion. On the closing day January 23,2019, President Shri Ram Nath Kovind will confer Pravasi Bharatiya Samman to select overseas Indians for their significant contributions in India and abroad. After the Convention, on 24th January participants will visit Prayagraj for Kumbh Mela. They will then proceed to Delhi on 25th January and witness the Republic Day Parade at Rajpath, New Delhi.